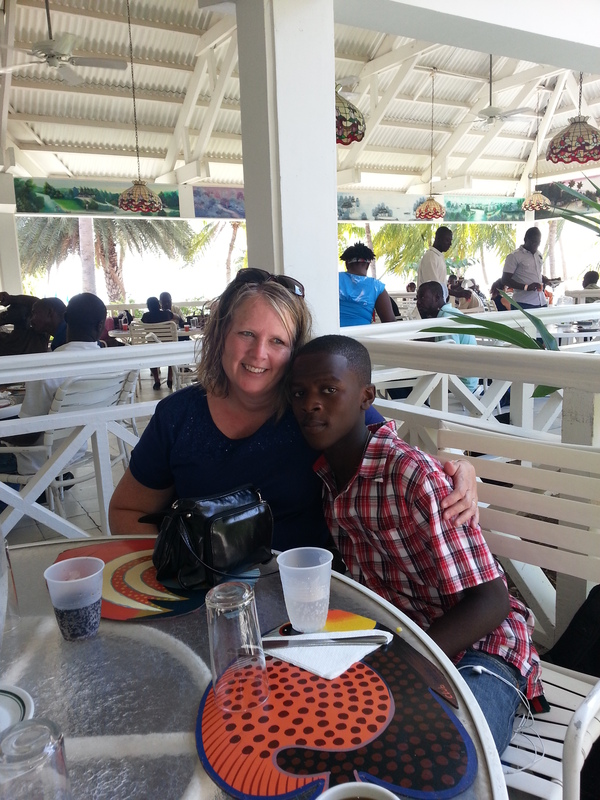 Me and my sponsor child Ericka. We are reading a book that she made for me. On a recent visit to El Salvador, I learned that gangs are a huge problem in the city of San Salvador. I also learned that children living in poverty are prime targets to be recruited into gangs and sometimes parents will send their children off to school and they never return home because they have been recruited by a gang. Something else I learned while in El Salvador is that a gang will not recruit someone if they are a Christian. There are parents who will put their child in Compassion’s program to try to help keep them out of gangs. Gang members will even put their own children in the program to keep them safe. 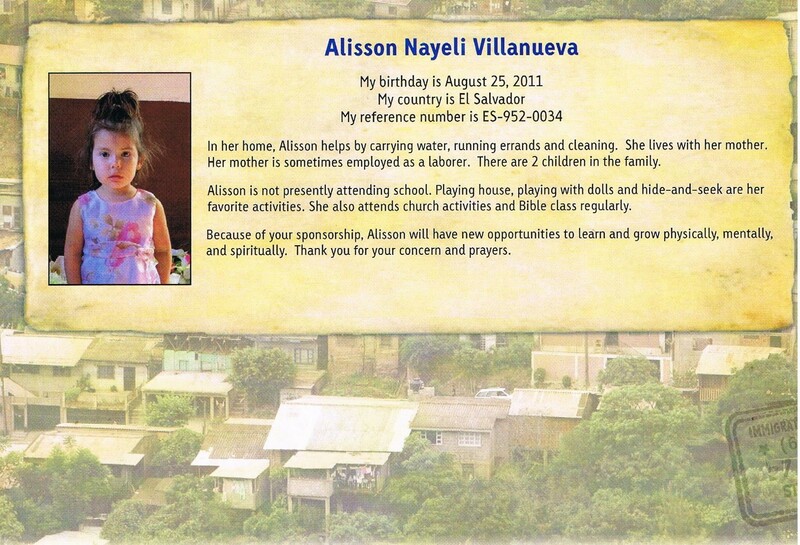 Children go to the Compassion project, learn about Jesus, and bring home what they learn to their family members. Some parents who were gang members have become Christians and left gangs. 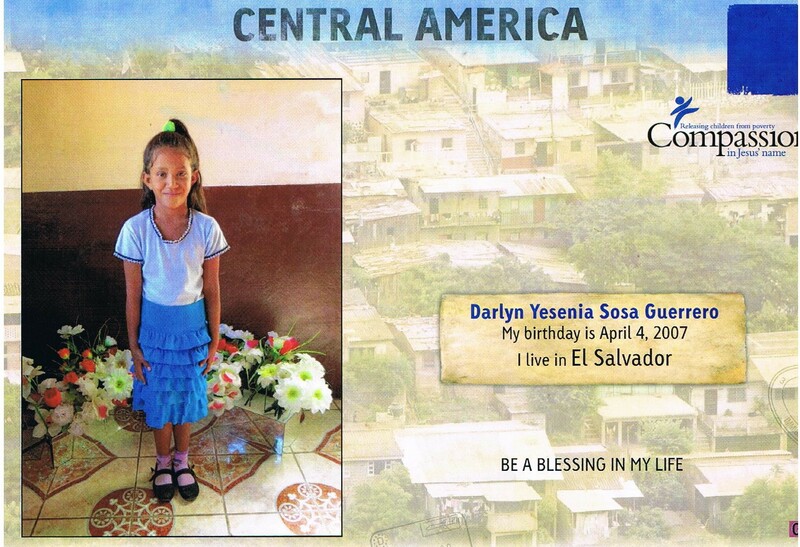 Because of the gang problem in El Salvador, I have started a campaign to try to help children in the country who are waiting for sponsors. Wouldn’t it be awesome to see as many of them as possible to be free from the violence that could await them in a gang? 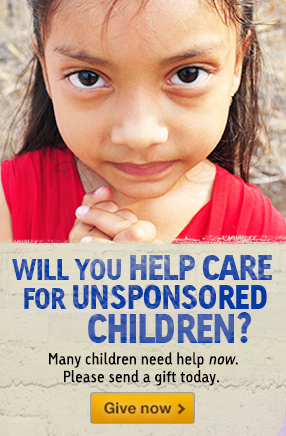 Also with a sponsor to share the love of Christ with them they also will know just how truly special they are! My new campaign can be found at this link -> A Gang of Eleven. Please take just a few minutes of your time to check out my page and say a prayer for the children on the page. Also, if you have a facebook, twitter or any sort of place that you can share the link, please please please share it. Thanks so much for reading and also thank you for your prayers! Last night my husband and I had a frozen pizza for dinner. Normally frozen pizza would not be my number one choice for dinner but my husband was the chef for the evening and that is what he cooked. The way I see it is if I don’t have to cook the meal then don’t I have a thing to complain about. When I really think about it, the fact that I have any kind of food at all gives me even more reason to have nothing to complain about. Did you know that there are families in which a meal was not available at all last night because they don’t have enough money to buy food? Today’s 12 days of Giving Christmas away gift is food for a mother and baby. Did you know that for just $15 you can feed a mother and her baby for a whole month! $15 is less than the cost of just one dinner out! 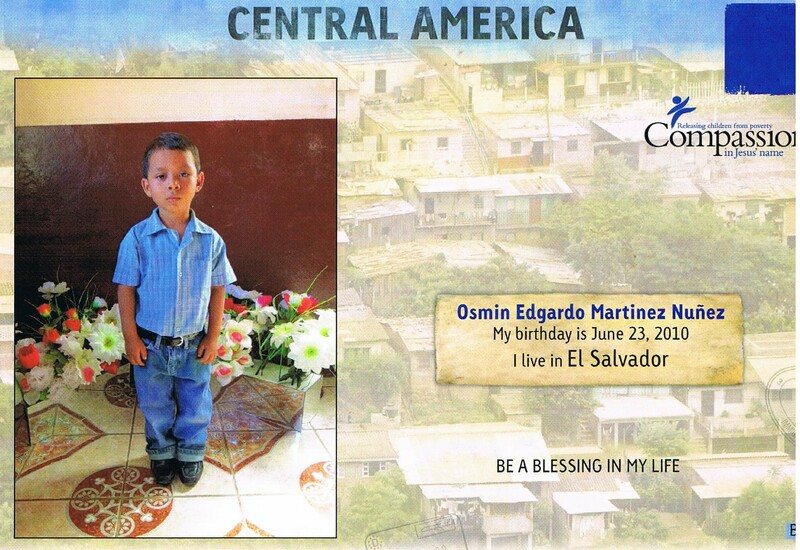 The picture of the mother and baby below is a picture I took in El Salvador at on of Compassion International’s Child Survival programs. As you can tell from the picture this is one very healthy mother and son! Your gift could help other babies to be healthy just like the little guy in the picture. Your gift can help stop the malnutrition that robs a mother and her baby of the strength and energy that they need to survive. 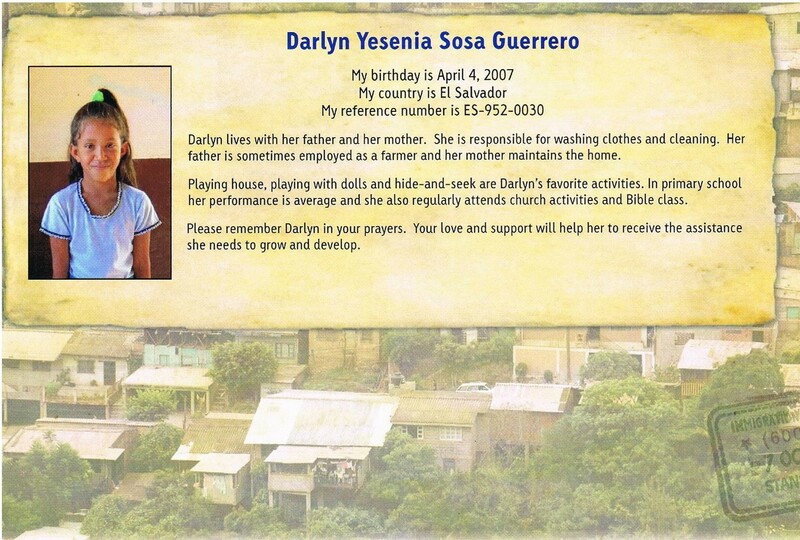 If you would like to help just click the picture of the mom and baby above and it will take you to Compassion International’s website. From there you can just follow the instructions and soon your gift will be on its way! What better way to celebrate the birth or our savior than by sharing his love as you help feed mothers and babies? Thank you so much for coming by today and have a great week! Squeals of delight echoed off the walls of our tiny concrete playground as we took our stance, lined up arm and arm, ready to guard the make believe goal behind us. Our three year old opponent was in position eyeing us up, a look of determination on her face. With her tiny foot posed behind the lopsided pink ball, she counted, “Uno dos tres!” Suddenly the ball was sailing toward us and more squeals of delight erupted as the ball made its way through our legs and into goal. We all cheered as three year old Genesis jumped up and down, clapping her hands in sheer delight. “Score!!! Mine! Mine! Mine!” she said. Her joy was contagious and we couldn’t help but join her in the celebration. There was so much to celebrate today because not only was Genesis winning in this game of soccer but she was also winning in life! This was my second day El Salvador and that morning our group had visited a Compassion child survival program called “Little Friends of the King” and now this afternoon we were visiting three year old Genesis and her mother Vanessa who are part of that program. In the area where Genesis was born the infant mortality rate is very high. Many babies never make it to birth and many who are born never make it to their first birthday. If Genesis’ mother ‘Vanessa’ had not been a part of the child survival program Genesis may have been very different from the child we were playing soccer with today. Being in Compassion’s Child Survival Program helped Genesis’ mother to learn how to take care of herself and her baby during her pregnancy and after by giving her pregnancy coaching, medical care, and emotional, nutritional and spiritual guidance. Vanessa also learned how to care for Genesis after she was born and Genesis also receives medical checkups and her childhood immunizations. The Child Survival Program also has vocational training such as cosmetology, jewelry making and sewing classes. Vanessa showed us a sewing machine that was given to her by Compassion and she told us that at the CSP she was able to learn how to sew and she showed us clothing that she makes and sells in the market. Learning this valuable job skill has helped Vanessa to be able to support herself and her daughter financially. It was very obvious how much being a part of this program has made a world difference in Vanessa and Genesis’ lives and has helped Genesis to develop into the healthy, bubbly little girl we were playing soccer with today. Our game of soccer continued most of the afternoon with Genesis making the rules. We didn’t mind at all to be playing by the rules of a 3 year old because Genesis’ rules were fair (and also a lot of fun!). We all took turns playing each position. There were only two positions, you were either a Kicker or you were a Goalie and you clapped and cheered when anyone scored. As each of us took our turn to kick the ball Genesis would place the ball on the spot where we would kick it from. When it was my turn to kick the ball, just as I was getting ready to kick, Genesis suddenly moved out of her goalie position, picked up the ball and moved it closer to the goal. We all laughed and then I took my turn kicking the ball from my new spot which was closer and gave me a better advantage of getting it in the goal. I didn’t think too much about Genesis moving the ball closer to the goal at that time but now I have had a little more time to think about why Genesis may have decided to move the ball closer when it was my turn. I have a knee problem which causes me not be able to walk or jump very well and though I never said anything about it to anyone, I think Genesis still may have noticed and I think maybe she didn’t want me to be at a disadvantage when it was my turn to kick the ball. Something I noticed about Genesis’ game of soccer is that no matter which team we were on we were still all winners and we were all cheering each other on. Because of the small space we were playing in, the goal was only about four feet away, but I am guessing that in the eyes of a three year old, four feet must look pretty far and when it was my turn to kick the ball Genesis made sure I would have a fair chance at getting the ball into the goal just as everyone else did. 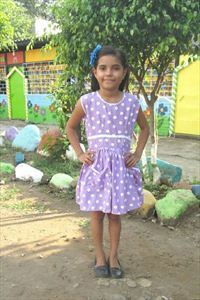 Being in Compassion’s Child Survival program has given Genesis the advantage that she needs too. Because of the assistance and the hope her mother receives Genesis was given a fair chance at life and now she is a healthy, joyful and thriving little girl today! If you would like more information about how you can help mothers and babies like Vanessa and Genesis receive a fair chance, you can visit Compassion’s website by clicking on any of the pictures in this post. Thanks for reading and have a blessed evening! I can’t believe its already another Monday morning! It seems as if time sure does seem to be flying soooooo fast anymore! As you know every Monday I try to post a song that moved me during the past week. ‘Try‘ was the magic word in that past sentence because I have totally missed posting the last 2 Music Mondays. I think I may have a very good reason as to why I have missed the last 2 Music Mondays, tell me if you agree 🙂 The first Music Monday I missed because I was in El Salvador and then this past Monday I think my head and heart may have still been in El Salvador. Since returning home I have had a really hard time getting back into my life here. I can’t really explain it but it’s almost as if some of the things that used to seem important to me now seem somehow a little silly. There were so many things that just touched my heart while I was there in a way that I feel as if I never will forget them, and truthfully I hope I never do forget what I experienced during my trip. Though I don’t want to forget, the problem right now is that many of those things are still whirling in my mind and the processing of those thoughts has been a hard thing for me to do. It just seems like I am getting nowhere fast in the processing. Its not anything bad, its just a lot is on my mind and I feel as if my brain might be on some sort of overload. I came home from El Salvador wanting to tell everyone right away all about my trip, but yet it’s all so hard to explain. I have journals that are full of notes I’ve written and I have also started about 4 blog posts. I thought by now I would have posted all sorts of stories on my blog but so far I have only posted one story (Unexpected Loan Payback – Day 1 Casa de Pan). Everything is still a jumbled of thoughts in my mind at the moment and it feels as if my thoughts seem almost as if they are too personal to share; but yet I also know that I did not experience all if this to keep quiet about it either. I am pretty sure that at some point with God’s help I will be able pull my thoughts together. For right now I will share this small tidbit of information from the last day of the trip. Our last day in El Salvador our van pulled up to a Compassion project and we were met once again by children who were lined up waiting to greet us. They were playing instruments and blowing whistles. By the way…I feel I must mention that who ever had the idea that hundreds of children should all blow whistles all at once inside of a large echoing room must have never heard the sound of hundreds of children blowing whistles all at once inside of an echoing room 😀 I think my ears are still ringing and that is one experience from this trip I will NEVER forget 😀 Even though it was quite painful (just kidding… well maybe not) they were so cute and having so much fun! They were once again another one of those blessings that just seemed to be happening one right after another all week long. We eventually made our way to the front of the church and as we stood there looking back at the faces of those happy children the song ‘Oceans (Where Feet May Fail)’ by Hillsong United was playing. I had heard the song before but had never heard it in the way as I was hearing it right then. It was the last day of the trip and by then I had already seen God moving in such a big way throughout the whole trip and it was at that moment I realized that God had led me here to this place, and He was right there, right now and I was standing in His presence. I will call upon your name, keep my eyes above the waves, my soul will rest in your embrace, I am yours and you are mine. What song moved you this past week? This is Luis Antonio Ventura Rodriguez. Luis’ birthday is February 7, 2008. He is 7 years old. Luis lives with his mother. His duties at home include helping in the kitchen, running errands and cleaning. There are 2 children in the family. His mother is employed as a farmer. 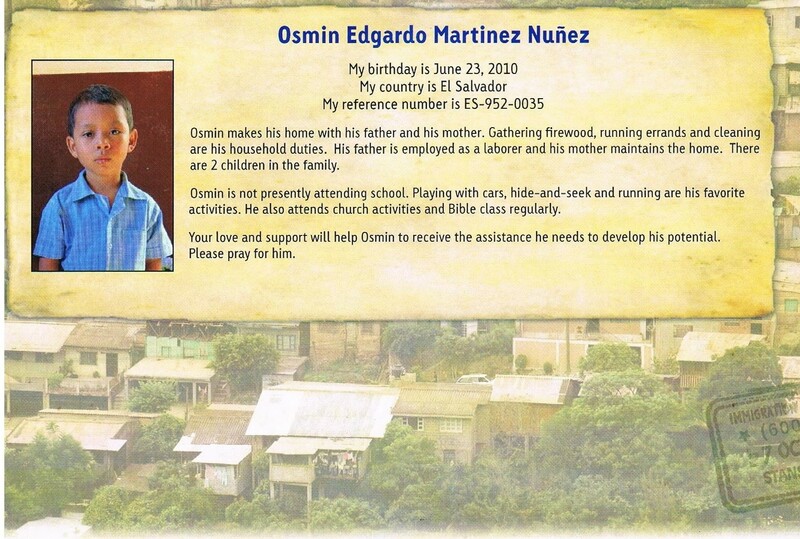 As part of Compassion’s ministry, Luis participates in church activities and Bible class. He is also in kindergarten where his performance is average. Soccer, playing with cars and running are his favorite activities. You may not be able to change the whole world but you can most definitely make a difference in this one child’s life and I can promise you that sponsoring him it will also make a difference in your own life. What have you got to lose?? For about the same price as a cup of coffee each day you can make a difference in Luis’ life, Please consider what that means. If you would like to know more, you can leave me a message and I will send you more information. 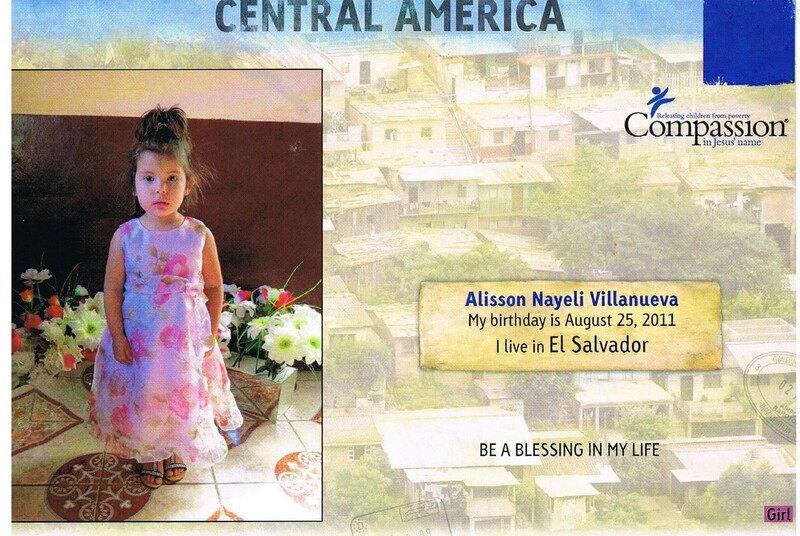 I got a really cool email a couple of weeks ago from Compassion telling me they are opening a brand new Child Development Center In El Salvador named “Casa del Pan” or “House of Bread” and they have invited me to come with them this September on a on a Women of Compassion Vision Trip & Retreat..
Another cool thing that is happening is we are also advocating for the children who will be a part of this new center and we will also get to visit the center and and meet the children we are advocating for! I am so excited for these children who will now have the opportunity to learn and grow physically, mentally and spiritually! 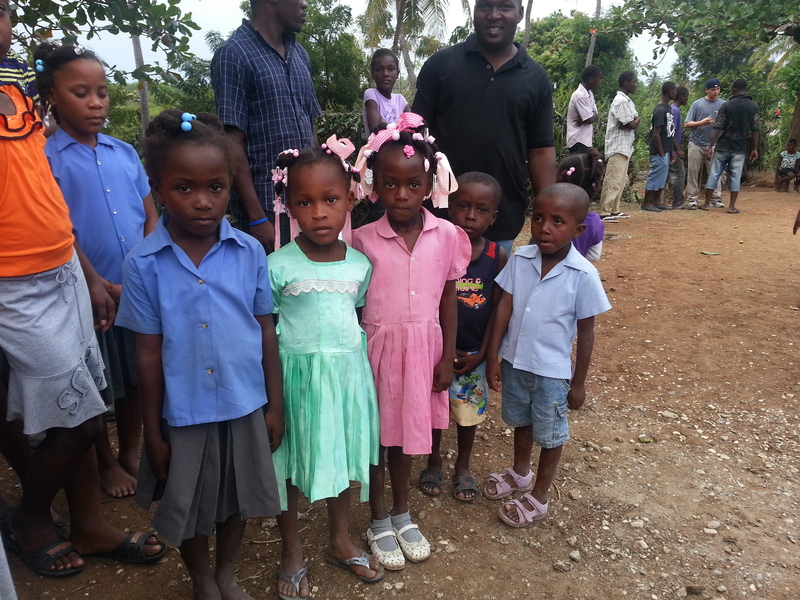 Could it be that maybe you are the sponsor that one of these children have been praying for? I have seen first hand that sponsorship works. I have also been on a trip with Compassion and seen how and where they work and I have also met some of the children and families who’s lives have been changed. 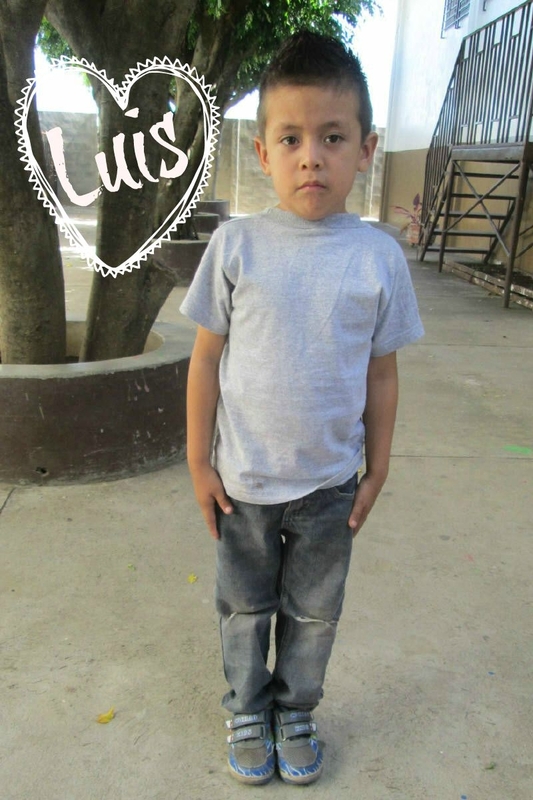 If you would like more information about how you can help change the life of one of these children, leave me a comment or send me and email at tluvs2trvl@yahoo.com. Before I go today I would also like to ask if you will please say a prayer for each of these children to receive sponsors quickly and that their lives will be blessed and that each of them will know the love of Jesus.